PHILIPSBURG, WILLEMSTAD - The owner of Checkmate security Oneil Arrindell has been shipped to the SDDK prison in Curaçao after the judge of instruction on St. Maarten extended his pretrial detention on Tuesday morning. This is according to a report from the Sint Maarten news agency SMN News. According to information reaching SMN News, Arrindell was escorted by the anti-corruption team to Princess Juliana International Airport on Tuesday in order for him to travel to Curacao for his pretrial detention. SMN News further learned that the prosecution and judge of instruction took the extra measures because some of the guards working at the Pointe Blanche prison are working for Checkmate Security. 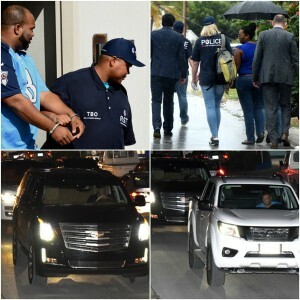 On Monday, the team of detectives swept the offices of Checkmate Security, his home, the hotel he owned in Pointe Blanche and also the Harbor. At each location, a number of items were seized. A spokesman for the Prosecutor’s Office Gino Bernadina confirmed that Arrindell appeared before the judge of instruction and that his pretrial detention has been extended. Bernadina also confirmed that Arrindell was sent to Curacao for the remainder of his time in custody because his workers are working at the Pointe Blanche prison.